We recently conducted a study among 800 US consumers to gauge their understanding, interest, and perception of privacy and security. There are many interesting data points and Ben has already shared some key ones that relate to brands in this article for Tech.pinions. I want to focus on where and when privacy and security matter the most. We asked our panelists to tell us on what device they value privacy the most. You will not be surprised that 60% mentioned their smartphone. Considering how much we do with these devices – take pictures, shopping, navigation, email, messaging and, of course, calling, and how much we store on them – pictures, videos, emails, credit cards, contacts – we want to make sure our data is private. However, not all consumers rely on smartphones in the same way. The more tech savvy they are, the higher their reliance on smartphones and therefore their need for privacy. So, privacy being important on a smartphone was mentioned by 73% of early tech adopters vs. 53% of mainstream consumers. Technology laggards are still relying more on their PCs than on their smartphones. The PC as the device where privacy matters the most was 49% for late tech adopters. 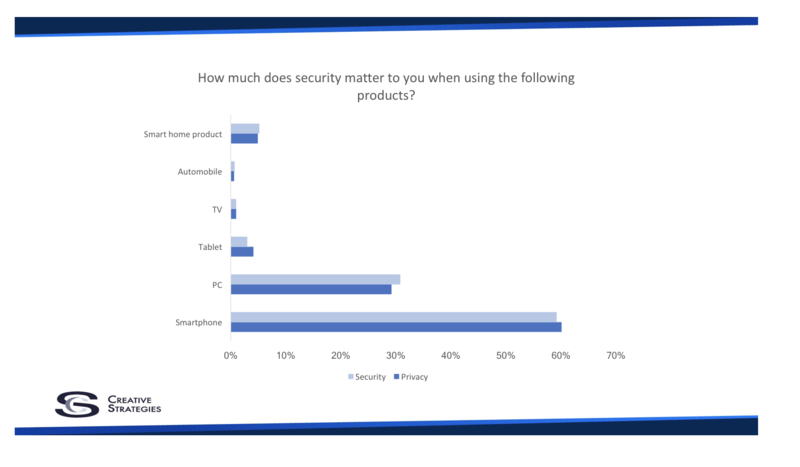 When it comes to security the data shows a similar trend as 59% of overall consumers mention the smartphone as the device on where security matters most. The range by segment though is a little different. Security on smartphones is also a top priority for laggards at 45% compared to 52% for mainstream consumers and 70% for early tech adopters. This higher concern for security from late adopters compared to privacy could be coming from their implicit trust for a PC that runs a firewall, VPN or virus scan. Privacy and security matter differently not only on the type of device but also on the services consumers access on a regular basis. The distinction between privacy and security gets blurry for some consumers but, when looking at services, it is pretty clear both privacy and security matter the most when data is involved — either because it is shared via email or stored in the cloud. Once again, consumers’ segments differ as their reliance on services changes in relation to their level of familiarity with tech. Early tech adopters and early mainstream consumers have made the shift in their communication habits from email to messaging and so, between the two, privacy matters more with messaging than it does with email. Cloud adoption has yet to spread much beyond early tech adopters which explains why this is the segment that mentioned cloud as the most important service when it comes to privacy – 33% – and to security – 52%. Early mainstream users are the only segment that puts privacy as being most important when it comes to messaging than cloud – 32% vs. 27%. It is somewhat comforting to see consumers have realized privacy and social networks rarely go together so there is little expectation there across the board. Most consumers have also realized they should take matters into their own hands when it comes to privacy on social media and 72% of consumers surveyed said they are more careful about what they post. 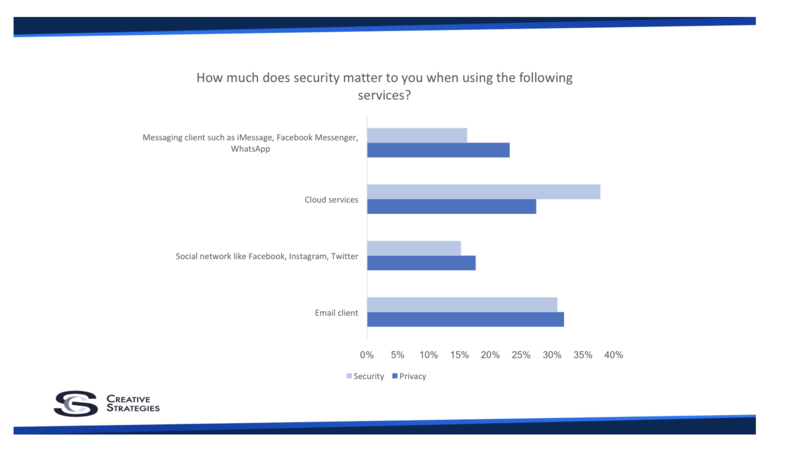 While users might have given up on privacy on social networks, they seem to still want security, especially when it comes to mainstream consumers who name social networks as the second most important service where they think security is important — 28%, second only to email at 37%. For early tech adopters, there is no doubt the cloud needs to be secure with 52% of the panelists mentioning cloud as the service where security matters the most. Email is at a distant second place with 22%. Even when it comes to increasing security, consumers are making some changes to their habits with 63% saying they vary their passwords across different sites and 47% saying they are changing those passwords more frequently. Privacy and security might still be hard selling points when it comes to consumer tech, but they are certainly becoming more important, especially for those devices and services we rely on for so much, so often.